Views, views and views with miles of coastline views from this second floor condo. 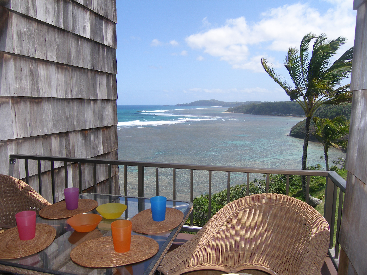 Enjoy overlooking Anini Reef and Beach to the Kilauea Lighthouse from this bluff location. Watch the sunrise – or perhaps more spectacular, the moon rise- from your lanai or just gaze all day long at the magnificent ocean and coastline. See the whales play and the albatross soar in season. This one bedroom/one bathroom condo is in excellent condition and is being sold fully furnished including custom built-in shelving, king size bed, queen sized sleeper sofa, washer/dryer, linens and kitchenware. Princeville Sealodge I is a community of 50 condominiums. It offers a swimming pool and barbeque/grill area for your enjoyment (shared with the Sealodge II association).